Thanks to Facebook, I have a chance to see my good friend Anthony from the photos he posted. He has tons of cocktail parties to attend. Almost in every photo he is holding a glass of wine... I know him though, he doesn't drink. And the kids, if they aren't not holding an ice-cream, then would be a plastic microphone... Maybe, we all love something in a cone shape?!? 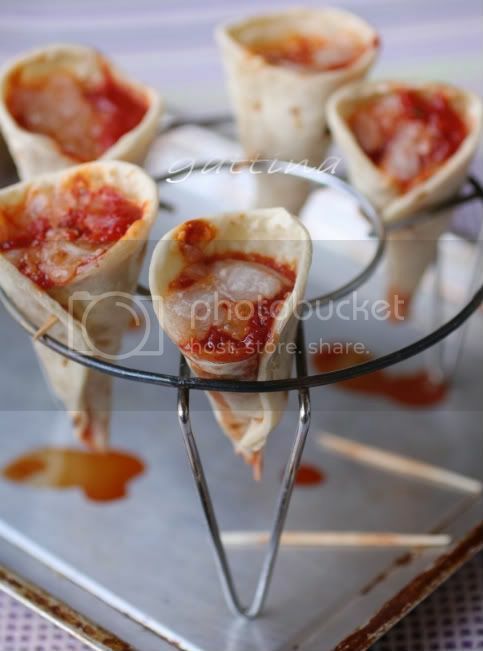 How about in the next party we serve these mini pizza cones? I am sure from toddlers to adults no one can resist! And they won't make a mess like sliced pizza when people walk around with it at hand. 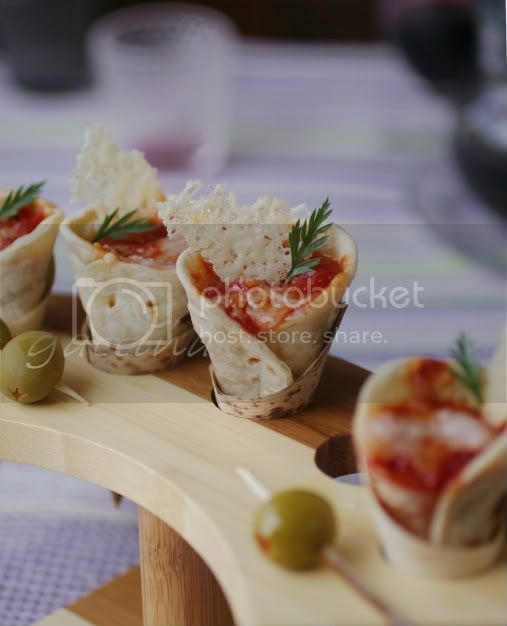 The pizza base/cone is actually a home-made tortilla bread. Once you taste the home-made, you won't go back to the commerically manufactured! The traditional/classic tortilla has lard or vegetable shortening in it, but since olive oil is so famous and superb in this country, I see why not to use it instead. The bread might lose the authenic fluffy texture, but use it as a pizza base I think it is absolutely acceptable. Making it to a cone isn't complicated at all, and I am showing you how we achieve it just with a couple of simple things. Well combine all the above ingredients, knead about 3 minutes, the dough should feel moist but not sticky. Divide the dough to 12 portions (each weights about 70g). Roll each to a circle with a thickness of 3 mm. Pre-heat a large non-adhesive skillet, without adding oil, cook dough over medium to high heat for a minute, then cook the other side for a minute or less. Stack the cooked tortilla together in order to let the steam keep them moist. Serve warm. They freeze well too. After they cool off, separate each tortilla with a piece of plastic film, seal the stack of bread tightly, go to the freezer. Place the cones on a rack. Like this rack is readily available at most Asian grocery stores (we normally use it for steaming). 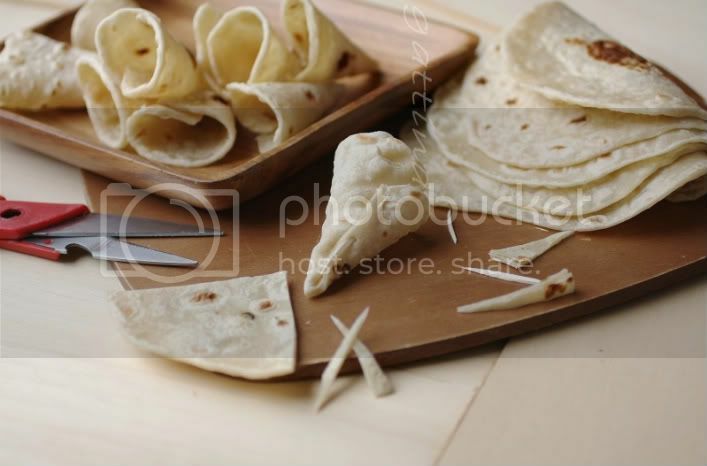 Cut a tortilla bread to 3 to 4 equal slices. Take one slice, close its two cut sides together and fasten with a toothpick, a cone is formed. Repeat to the rest. Gently push little mozzarella to the cone's bottom (to stop the sauce leak too much during baking), then fill the pizza sauce and olive/onion/ham/etc to the top, sprinkle some mazzarella. Place the cones between two wire of the rack. If the space is too large, you can push a long toothpick through the cone and let the both ends of the toothpick rest on the wire. Bake the cones in a pre-heat oven 180C for 5 - 10 minutes. Remove all the toothpicks, garnish with fresh herb and parmesan, serve immediately. A great recipe idea. Very original and surely delicious! That is so clever Gattina. Got to try making torillas at home. Yours look fantastic. 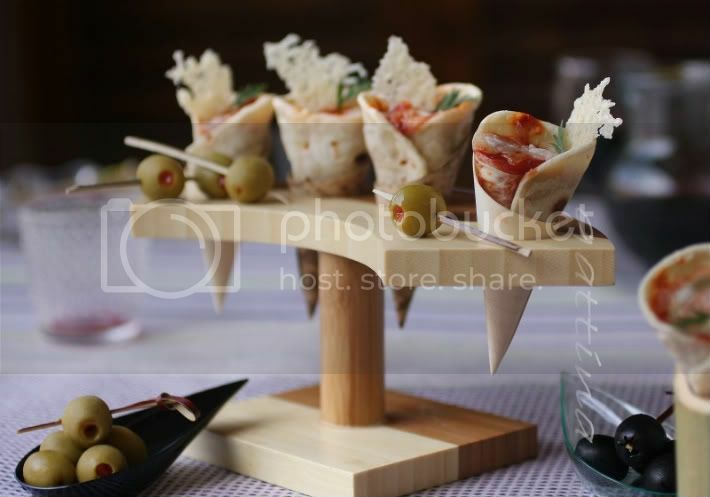 What a great idea for mini pizzas! They look fun to make and kids would have fun eating them too. I love, love, love this! How great! The recipe is great. But, I want to know what is strong flour? I didn't hear this term in India before. Please do help.